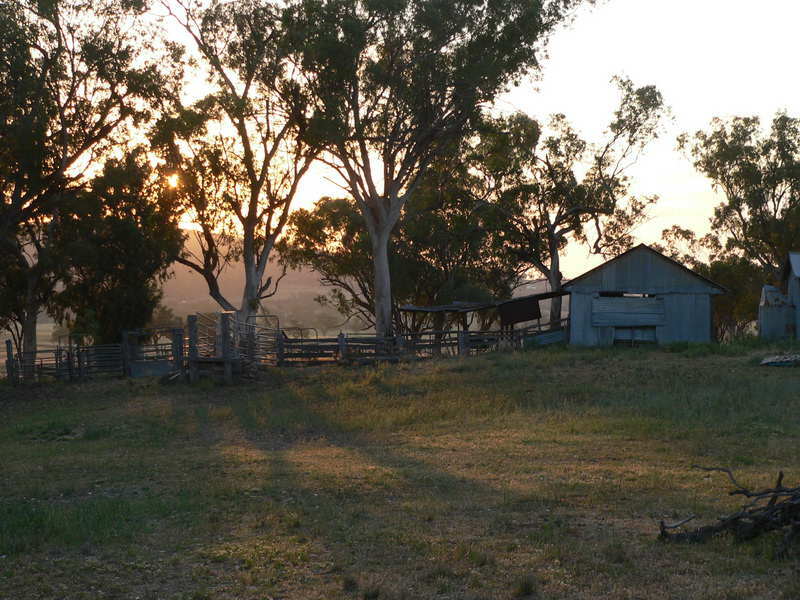 The photo below is the reference I am using for this watercolor landscape painting “Light Over Old Shearing Shed”. My main interest is to portray the light coming through the trees as well as the interesting pattern of shadows. The photo is of an old shearing shed on the farm of a relative of mine at Qirindi, NSW. The shed is no longer in use hence the corrugated iron over the opening. Watercolor is a wonderful medium for portraying light. Arches 300gsm Cold Pressed watercolor paper, quarter sheet (approx. 15″ x 11″ (38cm x 28cm)). Brushes: Round – sized 24 and 16 for larger washes and 12, 10 and 8 for smaller areas and detail. Watercolor paints: All Winsor and Newton artist’s quality – Cobalt Blue, French Ultramarine, Raw Umber, Burnt Sienna, Permanent Alizarin Crimson, Cobalt Turquoise, Aureolin and Cad Orange. Other items are: .7mm HB clutch pencil, stiff backing board, masking tape, old towel to control wetness of your brushes, tissues and simple watercolor easel. 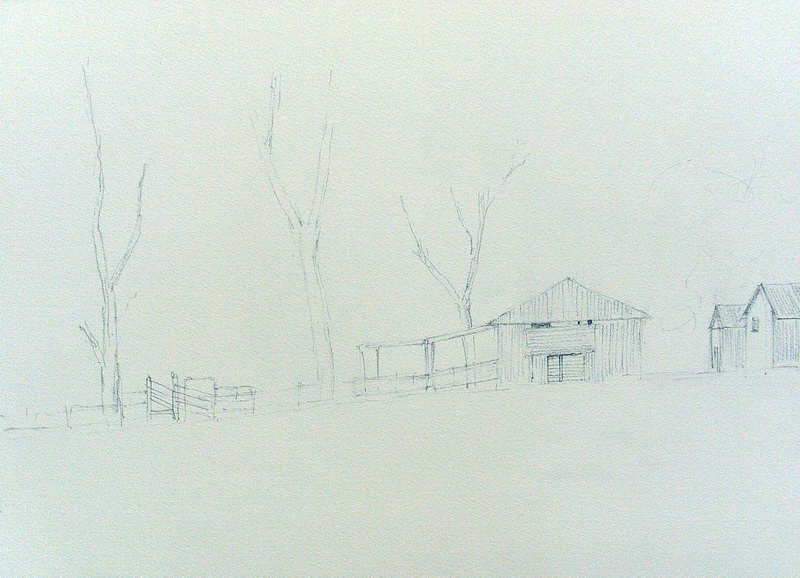 I did a simple drawing for this scene which focused on the separation between the trees and a reasonably realistic rendition of the shed. Notice that I drew in the lines representing the corrugations on the iron; these will remain and will appear through the watercolor wash. I did not draw in the hill in the distance as its shape is not critical to this painting. The spaces between the trees and other objects in the painting are important as an even, regular, separation could become boring. The trees on the right are only very lightly indicated, without any detail. While for the trees on the left I have only drawn in the main branches and trunks.